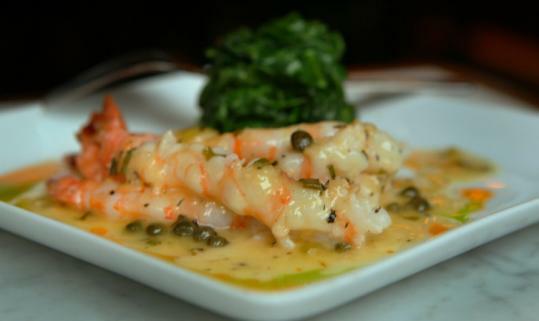 Garlic shrimp with lemon, butter, capers, and spinach at Ristorante Damiano. When it comes to the North End, small plates may not always work. Ristorante Damiano today becomes Carmelina's North End. The onetime piattini restaurant was very good, but people often associate this neighborhood with larger portions. "It was alot of fun doing 'Piattini' for three years at Damiano, and we did it with gusto and we did it the right way. Times change and trends come and go," writes chef Damien DiPaola on his Facebook page. DiPaola used to run the Italian restaurant Carmelina's in Western Massachusetts, while he was still a student at UMass-Amherst. He's renamed Damiano after his original establishment. The new menu includes appetizers such as ahi tuna arrabbiata, baby octopus stew, lamb lollipops, and meatballs. Among the pasta and risotto offerings: Damiano's outrageous penne gorgonzola, spaghetti with cuttlefish and squid ink, a real carbonara, Sunday macaroni (served every day), and mushroom risotto. For main courses, you'll find the likes of ossobuco, pan-roasted swordfish, and stuffed pork chops. Those who appreciated Damiano's format will be able to order smaller plates of pasta and risotto. Carmelina's will also have a Sunday lunch served buffet style. DiPaola writes, "It was time to re-invent Damiano and nothing could be better than bringing back tradition, love, and passion with Carmelinaâ€™s North End. The menu combines my mothers best dishes, my fathers best dishes, and my best dishes, with strong mediterranean and Sicilian influence."